Mrs. Burninwuba | Pump That Pedal - We've got it, You want it, Come and get it. Here’s a quick video snippet that Burninwuba contributed to us in which he films his wife’s tire spinning away as she tries to get out of this rut! Burninwuba’s wife peels out of the parking lot in her vehicle in this clip! 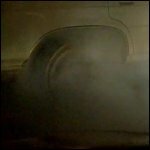 This clip is of Burninwuba’s wife’s foot as she does a burnout. Wow . 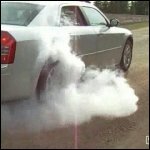 . . look at the smoke in this burnout clip! Burninwuba’s wife does an excellent job in this brake stand as the smoke builds up to the point where you can see the car. Ah, you’ve gotta love this one! 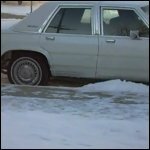 Burninwuba’s wife does a nice burnout in the snow and ice during this short snippet.